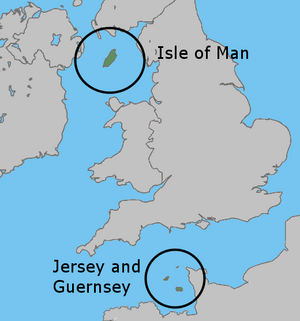 A British crown dependency is a special type of state. The head of state is the British monarch, who is represented by a Lieutenant-Governor. Each dependency has a parliament, government and prime minister to make all laws, except laws about defence and foreign affairs. Defence and foreign affairs are looked after by the British Government. But the British government in London has no power in the dependencies, unless the government of the dependency agrees. Some colonies also have a government, but they were created by the British government and can be ended by the British government. Crown dependencies Facts for Kids. Kiddle Encyclopedia.